Planning a business is like planning a trip. You can't expect all the plans you make ahead of time to be set in stone, because things change. Let's say that you planned a trip last month, and that next week you are supposed to fly to Miami. Only a hurricane is about to strike Florida. So of course you'd be foolish to fly there, just because you don't want to change your plans. But when planning their businesses, people often make plans ahead of time and stick to them, even when it makes no sense any more. Sometimes people don't stop to realize that the business plan they wrote two months ago is no longer working, no longer showing them where they need to go. When things change, you have to wake up and change too. So that's the mindset. You're excited. You're planning. You don't just have a plan and follow it, no matter what changes take place. I am biased! I am proud of Business Plan Pro. I have put a lifetime of experience into the product. It is an ideal tool if you use it in a way that respects your own thinking - you only let it manage the mechanics for you. The flexibility, plan-as-you-go approach is critical. Because I'll tell you, I writhe in anguish when I see people who just use the program to create a business plan, and then walk away and stop planning. You are on a computer, after all. You've got navigation. You can move from block to block. You can say, I am tired of working on the mission statement right now, so I will go to the sales forecast. Oops, the sales forecast just told me that I need more cash, so I will now jump to cash. 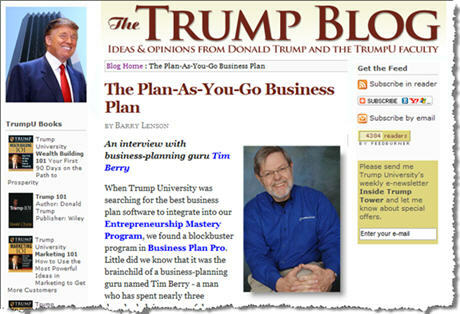 Business Plan Pro, if well used, lets you do exactly that. I like to think of it as a modern version of one of those old loose-leaf folders where you can pull pages out, insert new ones - do whatever you need to do. But of course it does things that a notebook could never do. You can transfer your data over into a PowerPoint presentation, for example, or print out different documents for your team. But the beauty of the computer is that things keep changing as you do your Plan-As-You-Go Plan. Your business plan will evolve into something remarkable - a vision that is a reflection of you, your business and your dream. One of the best things about my job is watching as people create things and make them grow. I got an email today from Jan Stumbo, who has created Soul Arts Foundation. The Soul Arts Foundation greatest commitment is working with children in sheltering agencies and encouraging individuals of all ages to develop their full creative potential through visual arts. Provide the basic principles of Art, tools, and media for those individuals and conduct supervised classes for creativity and self expression with children and adults. Don't serve tofu when you promised turkey. Make sure you send your subscribers the kind of email they signed up for. If they are expecting a monthly best practices newsletter, don't send weekly product information emails. Respect what they did (and did not) opt into. You will keep your customers happy, and keep them as loyal email subscribers if you are delivering relevant information to them. Don't get lazy - keep them interested and keep giving them what they want. Let them eat cake! We just released Business Plan Pro® version 11.0 at www.paloalto.com. Our newest version of our best-selling business planning tool has been improved to help anyone easily write a professional business plan. Check out all the features of our latest version. I was scammed 37 times! I'm a big fan of social review sites. I like to know what other people thought of the product, CD or book I'm about to purchase. It doesn't always sway my eventually purchasing, but I do like to go into everything with my eyes open. Buyer be wary so to speak. When I stumbled upon an ad link stating in 24 point font that he'd been "scammed" 37 times, I felt compelled to click it. Really, how can you not click on that kind of a headline? The author was trying to warn everyone about the different online scamming programs that say they can help you to earn money fast online(!) and telling us about his system which wasn't a scam at all(!). And you should buy it Right Now so that you to can start making Big Bucks(!!). I couldn't help but giggle while looking at the ridiculousness of the entire page. (Not to mention wondering if he got paid per exclamation point.) Yes, I give a great deal of weight to peer reviews of products, but if someone has been scammed 37 times... what is his review of the product he settled on or trying to sell worth to me? Word of mouth can mean big business, but between you and me, I wouldn't want this kind of review anywhere near my business. You may be turning off more customers than you meant to. When I was little my favorite color was red. Then later when I was a teenager, it was black, then in college it was back to red, and now I find myself buying everything in black and gray again. So what does this have to do with business? It's a reminder that when it comes to marketing and advertising materials everyone will have an opinion, and their opinion is not necessarily relevant. A few years ago we changed the color of our box from blue to orange. We did it for many different reasons. Of course everyone in the company had an opinion on whether we should go to red, yellow, green, orange, etc. Ultimately though, the marketing manager dealing with the creative agency and in charge of the box had to make the decision and had to deal with the fact that many employees hated the orange color. But it was the right choice and 3 years later we still have an orange box. The moral of the story? Not everyone in your company should be given an opportunity to comment on your marketing and advertising. The people responsible for marketing should make the decision, and the rest of the company should let them do that. Read a great blog entry that inspired me to write this post: "Defeating the Armies of No" on Marketing Profs Daily Fix. Tim Berry will be joining Anita Campbell from Small Business Trends today on her radio show to talk about the Plan As You Go business plan, his most recent attitude adjustment on the growing need for agile and flexible business planning. He'll be touching on the current state of business planning and where he thinks it's heading. To listen, point your browser to the Small Business Trends Radio website today November 6th, at 1:30pm Eastern time. "AskWiki, developed in partnership between AskMeNow and the Wikimedia Foundation, is a preliminary integration of a semantic search engine that seeks to provide specific answers to questions using information from Wikipedia articles. The engine is still in early stage development and has been designed to foster community involvement to help improve the search service and interface over the development period." I've already asked it several questions and for the most part, have received relevant answers in return. My favorite being the question, "Why do birds suddenly appear every time you are near?" Which is not in the least a business question, but it sure did give me a smile. Tim Berry will be joining Anita Campbell from Small Business Trends tomorrow on her radio show to talk about the Plan As You Go business plan, his most recent attitude adjustment on the growing need for agile and flexible business planning. He'll be touching on the current state of business planning and where he thinks it's heading. To listen, point your browser to the Small Business Trends Radio website tomorrow, November 6th at 1:30pm Eastern time.